يوفر فندق Oaks Horizons Hotel ظروف إقامة راقية وهو خيار رائج للسياح ولرجال الأعمال أيضاً. يقع في منطقة مطاعم, سياحة, تسوق من أديليد. يمكن من هنا للضيوف الاستمتاع بسهولة الوصول إلى كل ما تقدمه هذه المدينة النابضة بالحياة. يوفر الفندق بفضل موقعة الجيد وصولاً سهلاً إلى أهم معالم المدينة.
. ببساطة كل الخدمات وأساليب الضيافة التي تشتهر بها Oaks Hotels & Resorts تجعلك تشعر وكأنك في بيتك. يمكن لضيوف الفندق الاستمتاع بالميزات التالية على أرض الفندق: مكتب الاستقبال على مدار الساعة, تسجيل وصول/خروج سريع, تخزين الأمتعة, واي فاي في المناطق العامة, صف السيارات . في الفندق غرف نوم يتجاوز عددها 125، كلها مجهزة بعناية وجمال وبعضها مزود بـ غرف لغير المدخنين, مكيف هواء, تدفئة, مكتب, شرفة/ تراس. يمكنك الاستمتاع بالأجواء المريحة التي تقدمها مركز للياقة البدنية, ساونا, حمام سباحة داخلي, سبا طوال النهار. مهما كانت أسبابك لزيارة أديليد، فإن Oaks Horizons Hotel هو الخيار الأفضل لإقامة مثيرة وممتعة. يرجى العلم أن انتظار السيارات داخل نطاق الفندق متاح. يجب إجراء حجز مسبق لتاريخ الوصول (تُطبق الرسوم). 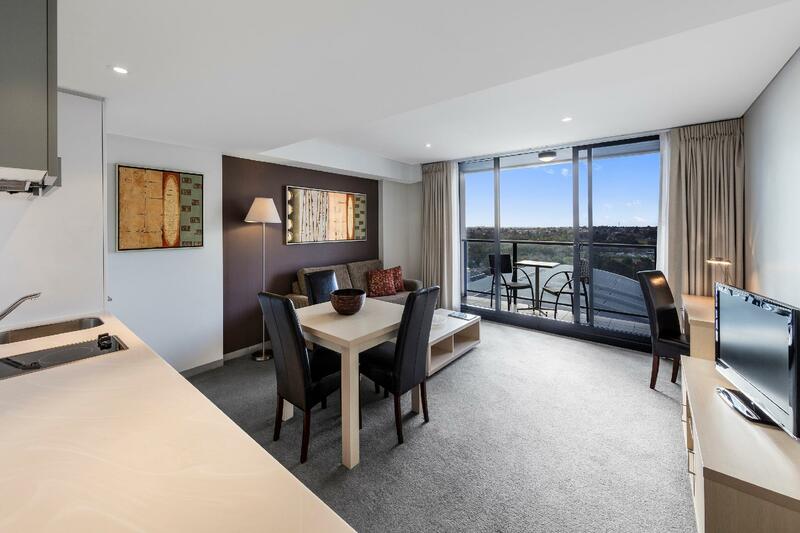 This apartment was very new, spacious and clean with a great location. Its perfect for families and those who wish to cook as it has a large kitchen. The swimming pool, gym and spa were also very nice. There was a restaurant downstairs but a bit pricey. Great apartment for 2 adults & 2 teenagers in the heart of the city. Spacious, clean and close to everything. 2 bedroom apartment was very comfortable and quiet. great views, excellent location - across the street from the convention center and close to food and shops. although not terribly out if the way this location wasn't ideal for where I needed to be. The hotel itself was good and clean but it was personality-less and I hate that. It's a nice place with well equipped and spacious rooms. Staff friendly and competent, clean and quiet and good location. Happy to stay again. Point losses: the wifi is very slow and you have to pay for it. Travel tip is to buy a portable router and plug it into the internet hard point when you travel and you have your own faster wifi in your room. Other loss was the key card reader in the Middle lift was infuriating, takes several goes to read and register. Hotel staff pointed this out on checkin, so hopefully it's on the maintenance log, otherwise get used to riding up and down a few times as you try to select your floor. Overall though, it's a perfectly fine place to stay and has great views on the river side. Staff are very good. Arrived late at the hotel. Security is good; after 8pm, entry to the hotel is by tapping of the card. Entry to the various levels is also by inserting the room card key. Staff at the front desk were polite and helpful. 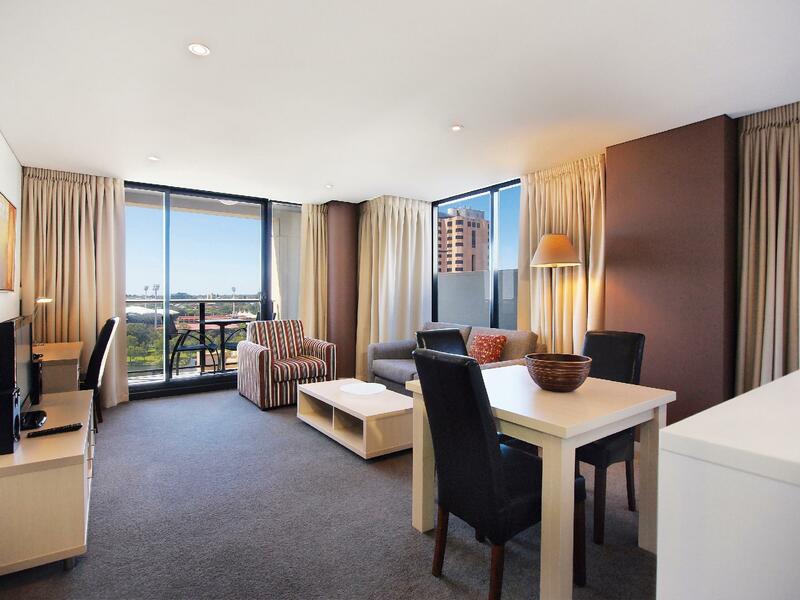 Our 1-bedroom apartment faced the Adelaide Convention Centre. As we were on a high floor, traffic from below was hardly audible. A small balcony outside the apartment was lovely to enjoy the night view. The apartment was serviced daily. It was clean and spacious. The bed was king-sized and comfortable. In the bathroom is a washer/dryer. After reading the instructions however, and after 2 runs, the laundry was still damp and I ended up ironing it. It would be better to have a washer plus a dryer. The living room was of the right size. The kitchen area had a small dining table, a fridge, microwave oven and was equipped with some crockery and a few necessary utensils for preparation of a simple meal for breakfast. Parking however, was charged at $20 per day fro a 24-hour period. The car park is just around the corner. Hotel is conveniently located with the railway station and tram stop just a stone's throw away. 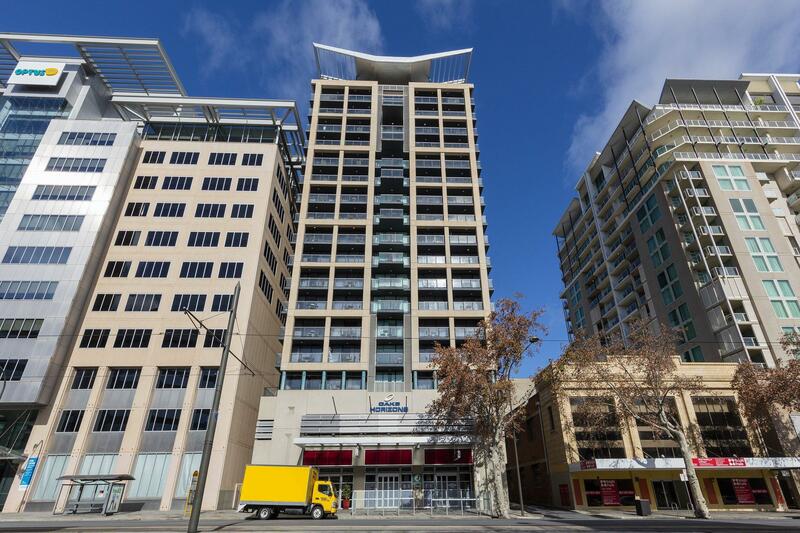 It is also of walking distance to restaurants and the shopping area of Rundle Mall. A little further away is Chinatown. It is located a short 15 minute drive from the airport and the beach. Easily accessible by car to the Adelaide Hills and Barossa Valley. Location is good, convenient to be close to the tram stop and the train station, Hindley street only a block away for good cheap eats, Rundle mall only three blocks so easy to get around. No restaurant/ bar etc so a bit inconvenient and the adjoining cafe/bar does not deliver to the room nor does it charge back. the kitchen is very small but has everything needed. You need to use your room card to access the foyer after 8pm, trying to find the swiper was an issue, its hidden behind a -plant. only really saw one person at the desk in the mornings.. very rarely anyone in the evening. But i suppose if you are not offering anything then why have staff on? I doubt i would stay here again although when the new hospital opens, it will be great for those staying for family/friends. We stayed in 1 bedroom apartment. It was quiet and comfortable, good value for money. The room provided king-size bed. There were LED TV in both living room and bedroom (with Foxtel). The kitchen was fully equipped. The hotel was close to Hindley street so it was not ideal for family. Ground floor had a bar/restaurant and it was a bit noisy and busy on Friday & Saturday night but we didn't hear anything from our room. Coffee club was just few meters away. Bus stop was just in front of the hotel. The only drawback was limited car park. We couldn't get Hotel car park but using Secureparking car park next door. The hotel had a deal with them so we could park for $18/24 hours (same price as hotel car park) but only single exit. This hotel was well fitted. My room looked fairly new, with model furnishings. The location was good, just on the corner of the grid style setup of Adelaide. The level I stayed on (level 6), had a strong cigarette smell. Which hits your face when coming out of the elevator. This hotel probably has apartments owned by long stay tenants and not just travellers. All rooms are non-smoking for hotel guess. The bed I stayed on was a little to hard for me. This could be down to personal taste, so could not really blame the hotel for the setup. Overall, I really enjoyed my stay and would return again when I am in Adelaide. Went to the football at Adelaide Oval, short walking distance from hotel. Care: if you need car parking at the hotel, make sure you pre-book as we had to move our car on the second day we stayed. Cable TV would have been nice but overall good experience at very reasonable price. 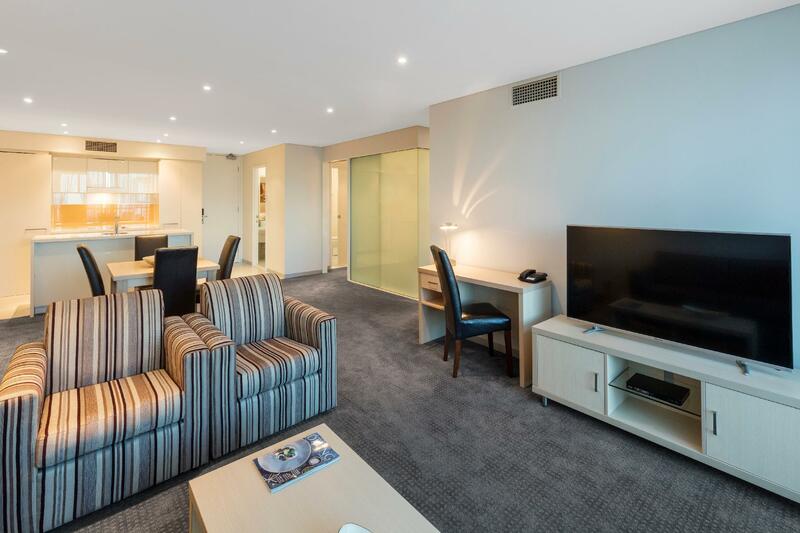 I been staying at few hotel in the Adelaide CBD, and I would say this one is the best one. We think it was a really reasonable price, and we got more than expect. We just love it. I will always stay in this hotel when I am going to Adelaide. 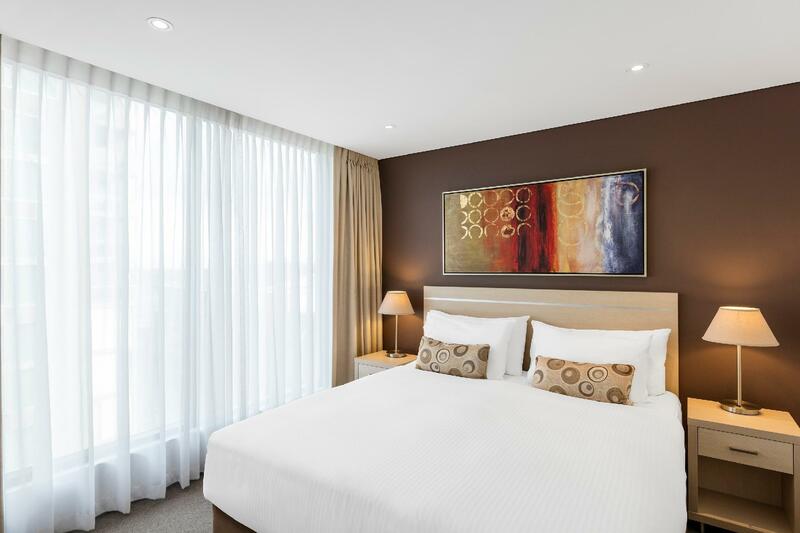 Nice room, I will return This is the first time I visit Adelaide and try to find the hotel which is not too far from CBD and located in quiet area. I recommend this Oaks Horizon. You can have a quiet night while it is only 5 mins walk to Rundle mall. The room is better than I expect for what I paid for. I stayed in one bedroom apartment equipped with everything you need to make meal. My complaint would be when I check in. They could not find my booking and fortunately, there was room available that night. I asked for high floor when I booked. I was put on 5th floor face parking lot. Anyway, it is good enough for me then after 12 hour flight, I just wanted to sleep. Watch out! The sink in the toilet is too shallow. Water splashes every time. Everyone seems to have the problem with the lift. The key card to get to each floor does not work at all. I notice that it happen with the first lift. Luckily, I had the tenant who stays there help me. Overall is fine. I was happy with the room the most. Next door is South Australia/Adelaide tourist information. Check it out! It's location,value for money and the cleanliness of the room and hotel. I was very happy with my room. It was very spacious,comfortable and clean. I would definitely stay there again.